There are so many ways that you can have and enjoy tortillas de harina at home. You can make them the traditional way, the fast-track-modern way (if you have an electric tortilla maker such as the REVEL…), or buy them ready made at the store. Different from corn tortillas, which rule Mexico’s south and are made with a base of nixtamalized corn, flour tortillas rule Mexico’s north and are wheat flour based. The latter also have an element of fat (either lard, vegetable shortening or oil) and are milder, sweeter and softer. Sometimes both kinds of tortillas, flour and corn, work interchangeably for a dish, say cheese quesadillas or chicken tacos, and may depend on the preference of the eater. However, beware, there are other times when either the flour or corn tortilla should be the prime choice. Take Chilorio, it needs to be tucked in a flour tortilla. Yet any kind of enchiladas, enfrijoladas, or casserole must, REALLY MUST, be made with corn tortillas because they withhold the sauce much better than wheat flour ones, and sweetness may be uncalled for. I have been surprised with how many requests I’ve received from people on how to make “good tasting,” “authentic homemade,” “white flour” tortillas, being both, that one can find them already made at the stores practically all over the US, and that it is time consuming. That, being said, the feel and taste of a homemade tortilla de harina does happen to be a galaxy away from a store bought one. So, if you can spare the time, and you like playing with your hands, give them a try. As you will see, the trick is not only in the right amounts of ingredients, it’s also in the kneading and mostly in the cooking: don’t over cook them or they will lose ALL their appeal. Of course, once you master the technique, you can flavor them with ingredients like fresh or dried chiles, tomatoes and even nopales. You can also experiment with making them using whole wheat flour. Though, I do prefer the plain, original taste. Divide into 18-20 ball shaped portions. Set them on a floured board or plate, cover them with plastic wrap or a clean kitchen towel and let them rest for 25 to 35 minutes. Heat your comal, or ungreased cast iron or non-stick skillet over medium heat. On a floured surface roll out one of the balls with a rolling pin, rotating 5 or 6 times until you get a 6 to 7 inch circle. Lay tortilla on the already hot comal or skillet. You will hear a faint sizzle. 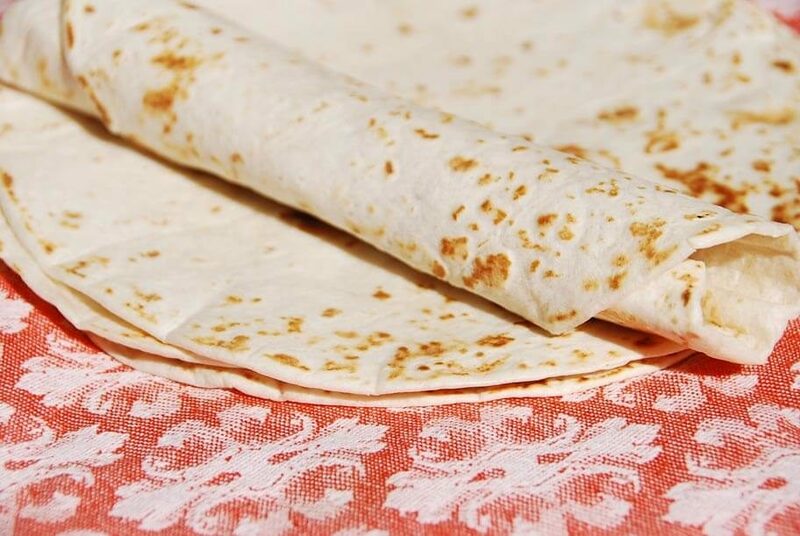 After 30 to 40 seconds, when there are brown freckles on the bottom side and there is some puffing up in some areas of the tortilla, flip over. Cook for 30 to 40 seconds, until the other side is freckled and the tortilla puffs up, again, like pita bread. Don’t overcook, or they will become crisp and stiff (and lose all their appeal). As they are ready, place in a tortilla warmer or clean kitchen towel. If you will not eat them within the hour, wrap them in a plastic bag and refrigerate. Reheat in a hot comal or skillet. Fast-Track-Modern Version: If you have an electric tortilla maker, such as the REVEL, instead of rolling them out with a rolling pin, place your flour dough balls in the tortilla maker, press for 1 to 2 seconds. This will roll and precook them; you will hear the hiss. Finish them off for about 30 seconds on each side on the comal or skillet, where they should also puff. Easiest version: Buy them already made at the store! Tortillas can take some practice…keep going, Bill! I’ve been in love with Mexican cooking since I moved to the San Francisco Bay area in 1968. Since then I’ve moved around a lot, but still use flour tortillas to wrap Everything. Now living in South Dakota, I have difficulty finding tortillas that are large enough. I want them to be about ten inches in diameter. I’ve tried making tortillas, but have always failed. They are never as soft and pliable as the store bought. One problem when making them that large is having a large enough surface to cook them. I’ve seen ladies in Tijuana using something that almost looks like sheet metal. Do you have any recommend surfaces for larger tortillas. I’ve thought of using a lefse pan (yes, you can get those around here). Thanks for your show. Oh you can find really large comales that would be great to make 10″ tortillas: https://patijinich.com/comal/ Have fun making them, Bill! I watched your show and got inspired to try making flour tortillas. I helped my mother make them for years until she said, “We can buy them.” It’s not the same. I make everything else Mexican – tamales, etc. but have never tried making tortillas. Thank you for the inspiration. Love your show!! I’m thrilled you gave the tortillas a try and loved them, Irene! Hi Pati ive been make tortillas since i was 13yrs old as of late i just started preparing but for some reason my torillas have been coming out dey and brittle am i doing some thing wrong? Please HELP! You can try them with a bit more fat and water, Valentin. I hope you give them another go! This looks like a great recipe Pati, thank you for sharing. I’m wondering if I can use a combination of butter & lard? When I was a young kid we would visit my cousin’s mother in law in Tecate, Doña Stephania, she made the best flour totillas, unfortunately we lost her many years ago & with her went the recipe. Your recipe seems simple like hers, but I remember her using both butter & lard in her dough. What are your thoughts? I can’t wait to try this recipe, it will be my first attempt at tortillas. Also can I use this recipe for buñuelos? Doesn’t the bubbles while cooking ,mean the middles are cooking ? Also what is the best to make corn tortillas with,,,they are my favorite. I don’t eat bread but I love homemade tortillas !!! These are fabulous tortillas! I finally got up enough nerve to let my cast iron get REALLY hot and it made all the difference. They cooked perfectly, ballooning on the second turn. I felt like a pro. Thank you! So glad to hear this, John! Hola Pati! Your tortillas are perfect and amazing thank you!!!! I just saw your TV Program, u r making sopes yum. Just got through making flour tortillas. All of them came out tasting like raw dough and on the chewy side, but they were cooked. Any suggestions on what I did wrong? Maybe less lard next time? Great recipe Pati! My mother always added a pinch of baking powder. Once the dough rests, it makes “fluffy” tortillas. Have you ever tried that? I don’t use baking powder in my recipe…I prefer to make them with just flour, salt, vegetable shortening or lard, and water! Do these tortillas stay pliable to make burritos the following day(s)? I recommend that if you don’t eat them right away, you store them in a plastic bag in the refrigerator. Then when you make the burritos the next days, reheat the tortillas on a hot comal or skillet, and they will be pliable. My family has always used the harina preparada mix. You just add water and it’s very simple. But where I live now, that mix isn’t available. I want to have the tortillas I’m used to, so would you compare this recipe to the harina preparada mix? Or if not, do you have an idea of a similar recipe? I really like the results from this recipe… give it a try! Son muy ricos !!! … pero mis tortillas no se inflan durante la cocción? … es verdad que no tengo un comal , uso un sartén de hierro fundido, tal vez es porque! Gracias para compartir tus recetas y me encanta tu emisora a la televisiòn (PBS)(VPT, desde Montréal, Canadá). Tal vez necesitas ajustar el calor/fuego del sartén por más bajito! Hi Patti, thank you for the recipe, can’t wait to try. I’m wondering can I use self rising flour or no? And can I use butter instead of lard? Thanks for the help. Love your show! You can absolutely use butter instead of lard…but I’d stick with all purpose flour if you can. Your recipe says the tortillas will puff up. Don’t they need the baking powder to do this? Thank you for this recipe. I love your show! If they’re kneaded well enough, the gluten that develops will tap the stream as the water evaporates, and cause it to puff up. Gluten is the reason they’re pliable, and why they’re also chewy rather than crisp, or crumbly. Mmmmm, gluten. ? Hi Pati! Love your show and recipes. Even though I’m vegetarian/vegan, they adapt to non-meat choices great! Tortillas however, I have not done so well with. I can make AP flour ones just fine (I used canola oil instead of shortening), but I was recently told by my Doctor, “No more white flour period!” So the problem I have is I can’t seem to get them right with whole wheat or whole wheat pastry flour. I can buy the organic whole wheat ones made with safflower oil in the store but when a pack of 6 soft taco size costs more than a five pound bag of whole wheat flour, I really need to make my own. Any help you can offer would be wonderful! Thanks Pati! This is a tricky one because you need very fine flour…. you may have to test with different brands of flour to get something to your liking! You forgot the baking powder. To make them rise. I don’t use baking powder in my recipe…just flour, salt, vegetable shortening or lard, and water! I make flour tortillas and put wax paper in between each tortilla and freeze them. My receipt is basically the same as yours except I use 1/3 cup shortening. My dad’s great aunt made fresh tortillas everyday for Tata. She would let us kids have a freshly made tortilla but only if we put butter and a little salt on it. Ridiculously good. Thanks. What a beautiful memory! Thank you for sharing Linda. You have a Tata too?! Thats what my kids called my Dad! I’m feeling nostalgic and remembering old family ways. 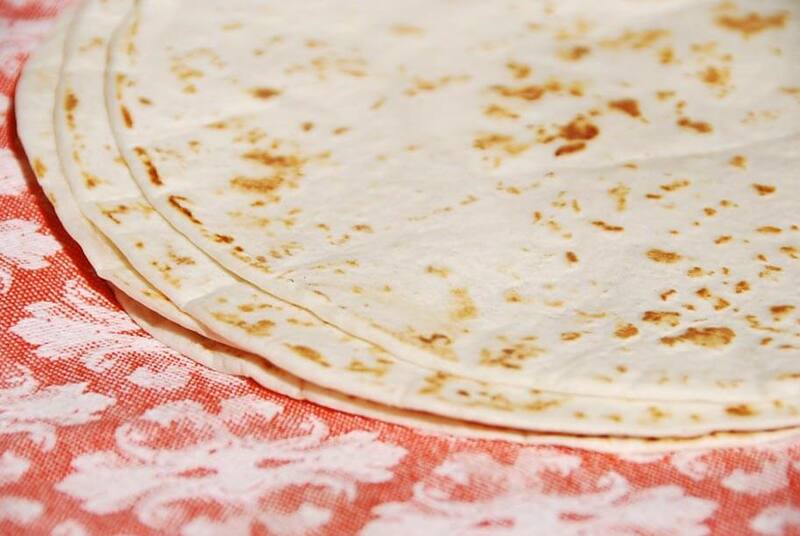 I have been thinking about my mother’s Aunt who made homemade tortillas for her husband at every meal. Now I want some of the old ways back in my life. Yesterday i saw the show and here was the recipe! It’s a sign, I believe. For New Year’s I’m going to try these. My dad, Tata, would have been proud. Have a wonderful New Year, Barbara! Bella, baking powder is not part of the ingredients in my home state of Sonora, México. That is the reason store bought tortillas are soooooo thick ? in the United States. This is great to get an exact measurement for the ingredients. My mom and grandmother really didn’t follow a recipe. A pinch of this and a pinch of that. I am excited to try making these. Thank you. I hope you enjoy them Diana! Hola Diana, yes you can try with your flour of preference. Test it out though as the ration my not be 1:1, and adjust as you go, making sure the dough is moist and malleable. Dear Pati! THANK YOU! THANK YOU! THANK YOU! This recipe is JUST what I was looking for. I told my husband I am going to try every flour tortilla recipe and experiment on my own until I perfected it. I have tried several recipes and they just seem to come out thick (although, it could just be I am not rolling it out enough). My mom used to make them everyday so I even went to her for a recipe. All she could tell me was just a dash of this and a little bit of that. : / All the recipes I tried, and even asked my mom, had baking powder. So when I thought to come to look for a recipe from you, and I saw no baking powder, I thought maybe it got missed. (I know, I know…silly me). So I went ahead and tried this recipe and TAAAA DAAA! This was it…this was the perfect tortilla recipe I was looking for. My husband said, this is the kind of tortilla I can eat all by itself!! He called it deliciousmess!!! : ) Thanks again! I’m super happy you and your husband love them Brenda! old school moms are that way… I have tried to ask my mom how to make things… and nope I can not just do, a bit of this and some of that… LOL alway us lard when you can vs. oil. Ms. Pati, my daughter and I made your tortillas and they came out great! The whole family enjoyed them! I believe we are going to continue with this recipe. Thank you for sharing!!! Super glad you, your daughter, and whole family enjoyed them! Is baking powder not part of recipe? I remember momma use to put some in recipe. Thanks Pati! My 7 year old daughter wanted to try to make your recipe for tortillas and that’s what we are doing. Hoping everything turns out great. I’ll let you know how it turns out. Do flour tortillas need baking powder? Nope! Just flour, salt, vegetable shortening or lard, and water! Let me know how it turns out! I made your flour tortillas this past Sunday with my family, they were so delicious! I did add a 1/4 teaspoon of baking powder to your recipe ?. Thanks for posting your recipe. I love your show always watch on PBS!! Thanks so much for tuning in! I’m happy you liked the tortillas! I followed this recipe yesterday but I I added 1/4 tsp of baking powder. They were delicious!! I had to make another batch because my nieces and nephews wanted bunuelos. Thanks so much. Love your show Pati’s Mexican Table on PBS. Thrilled that they were a hit!!! Thanks for trying the recipe! Love your show and the way you present your food. When I make my flour tortillas, I add a little dried cilantro, chili powder, or cilantro or all three which adds color and flavor to the tortillas. I made a small batch of tortillas using coconut oil. I used two cups of flour, one spoon of sea salt, a pinch of baking powder, 3/4 cup water, and two tablespoon solidified coconut oil. The dough had a different texture than the one with manteca, I made a batch with Manteca simultaneously too. It had a nice aroma of coconut. It puffed up bigger than the other batch. My husband was tasting as I cooked them and gave me a taste of the coconut oil one. I thought he had added butter it was so buttery in taste. I wI’ll definitely make sone again. Has anyone tried using coconut oil for the lard or oil ingredient? I purchased big jars of it to cook with and like the taste, but haven’t tried coconut-y flavored tortillas. I haven’t tried coconut oil, but you’re welcome to try it. You’ll have to let us know how it turns out! How long can you store them in yhe fridge? Hola Misty, They will stay fresh for about a week in the refrigerator. We freeze them. They last for a few weeks in the freezer. Then we just use them as needed and keep the rest frozen. I’m confused…. says “wheat flour tortillas” but then calls for all purpose flour. I wanted a wheat recipe, so I made this with wheat flour since that’s what they’re called, and the dough was so crumbly and stiff. Had to add more water. And I feel like they got all messed up. This is a very confusing recipe. Hola Dana, Sorry to confuse. Wheat flour is to differentiate from corn flour tortillas. Hola Lorie, Yes! Pulse slowly until all the ingredients are combined and the dough comes together. My tortillas shrink after I roll them out (before I cook them on the comal). What am I doing wrong? Hola Tricia, Try letting your portioned dough balls rest a little longer before rolling them out. Sometimes if they haven’t rested long enough, they will shrink. I usually let mine sit 25 to 35 minutes. Thank you for a flour tortilla recipe that does NOT use baking powder. My mother always told me the best flour tortillas did not include it, but she didn’t know how to make them. (She never made her own tortillas.) I had looked in many, many cookbooks & could only find recipes WITH baking powder. I can’t wait to use your recipe. Thank you, again. I just wanted to say I love watching you on Create TV. You make mexican cooking easy and enjoyable. Thank you so much for watching, Patty! Hi there… I guess my question is about the availability of a product in the here in the US. Masa de trigo or Harina de trigo. There are only a couple brands in my area in Colorado. Doesn’t the reference of trigo being wheat describe it as a wheat based or in general if it says Harina is that sufficent? I remember purchasing Masa de trigo for my grand mother. I don’t remember a brand name however. Would you clarify this for me please, as I can find it in Mexico, however I don’t know enough Spanish to order. I never learned Spanish or Basque from my grand parents sadly. Also, I am wondering if and when you will choose to do DVD’s of your shows starting with the first season, as I have missed almost all of them. I would love to have you as a great library and historic reference because you cover so much information. Would you or anyone else know how to make GF tortillas? I am from NM and have Celiac Disease so you can imagine how much I miss eating tortillas. Thank you. Marie, have you tried my recipe for making corn tortillas? When I make flour tortillas,the recipe I use calls for baking powder,I see your recipe does not. Which recipe would make softer tortillas? thanks for an answer to my question. Very rude response to L.Dl inquiry – “I like mine!” ¡Hay por favor mujer! I was looking for an honest and educated response, as my mamita also used baking powder in her tortillas de harina. I kid you not, my mom made the best tortillas in the hood… people would comment on the smell of her wonderful tortillas every day as she prepared dinner for us. Her tortillas were not pure white like yours, I’m sure it’s the lack of baking powder that makes yours look white. I miss my mom’s tortillas and refried beans so much, but I’m gonna keep trying to make them igualitas que las de ella and one day I may surprise myself! Btw, my mom was born in San Antonio and maybe your style tortillas are estilo mejicano? I really think it’s a tex-mex thing. Mexicans from across the border make the best tortillas de maiz but I don’t care for those. Thank you for this smaller recipe version. I have been making tortillas like my Mamieta taught me as a little girl. She actually showed me how to cook them on hot rocks in the back yard, really the authentic way she learned. I have always used a 5 pound sack of flour, and “felt” the lard and water part, so this will be a God send. I don’t need to make 200 tortillas any longer. Again, thank you very much. Can’t wait to start making enchiladas again, just smaller batches. Patti, is there anyway you can do a video of how to make flour tortillas? I see many recipes but I tried it and it was so messy and sticky that I haven’t even attempted it again. Maybe I’m doing something wrong that you can show me. Thx. Will have to try them, thank you Maggie! Give it a try Claudia! Maggie – How many tortillas does your recipe make? Do you use salt or baking powder? I am trying to recipe since I had some extra milk on hand, any more details on your process?